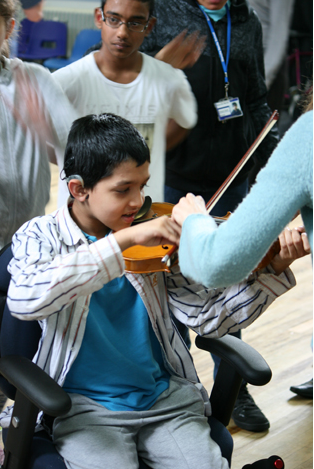 Sounding Out is project which explores the impact of music on deaf and hearing-impaired pupils. It is run by Creative Futures, one of our chosen charities in 2016. We asked Rimi Solloway, Creative Futures’ Communications and Information Officer, to tell us a bit more about this remarkable project. Sounding Out is an ongoing project with deaf and hearing-impaired children, in partnership with the UCL Ear Institute and the UCL Institute of Education. It seeks to explore how learning music can enhance pitch perception and speech production in deaf and hearing impaired pupils. 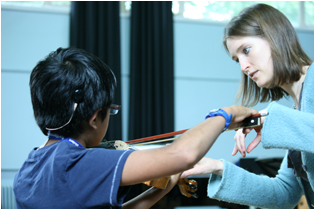 Our Creative Futures practitioners visit two specialist schools in London every week to provide vocal, instrumental and creative music-making workshops to groups of young people aged 11 to 14 years old. All of them have aural impairment and a range of special educational needs. These weekly sessions explore pitch, rhythm, notation and timbre through a range of musical activities including singing, vocalisation, composition and playing a range of instruments. Sounding Out is built upon findings from a long-term Creative Futures project at a primary school which suggest that specialist singing training improves pitch perception, production and speech perception for hearing impaired students, thus improving their access to and enjoyment of music; as well as their speech and communication skills in wider life. 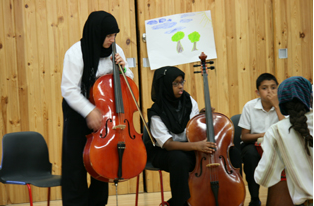 It also provides immersive instrumental music sessions at both schools so that students have opportunities to play a range of instruments and develop ensemble-playing skills. Each term’s activity is structured around certain themes or topics (for example, World War II) and we work with the students to explore how music could be used to represent different aspects of the subject. Key to making music is good communication, and we are developing the students’ visual communication skills as well as using a range of visual cues such as ‘graphic scores’ (pictorial representations of the music devised by the students themselves). 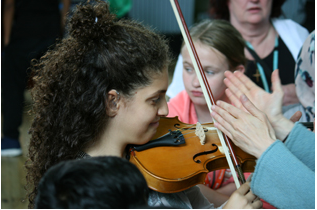 The aim is not only to offer deaf and hearing impaired children high-quality musical opportunities and experiences, but also to enhance their self-confidence and social skills. The principal funder of the project is the National Foundation for Youth Music which has pledged support over a three year period, including for the research element with our partners at UCL. Sounding Out is delivered by three specialist music-leaders every week, and we are training a further three each year as part of our commitment to providing training and mentoring opportunities for less-experienced workshop leaders. Our first research findings from the project are not expected until summer 2017, although one collaborative paper has been published in the Cochlear Implants International journal. In the meantime project updates can be found on our website at www.creativefuturesuk.com.